NOTE: As of 2/2019 the book has completed open alpha and is transitioning into a closed beta period. The final published book will look remarkably similar to the existing chapters published here, though may include new sections, better metaphors, 100% accurate grammar, etc. Each physical book will contain keys to unlock the dBook, allowing for middleman free resales with a finite supply (like a digital Margin of Safety). Each dBook will be provably unique and can only be accessed by the owner’s private key. The goal of writing this book is to provide a thorough explanation of the emerging distributed ledger ecosystem from both a technical and socio-cultural perspective. We feel the overwhelming majority of content about the distributed ledger space is oriented towards promoting individual projects to retail investors, or to corporate clients wanting to implement quasi distributed ledgers, and stops short of explaining how distributed ledgers work as an institutional grade macro thesis. Instead of looking at the markets from a “what-can-it-do” perspective, our world view is skewed towards asking “how-can-it-break” and “who-will-survive”. Use cases like crop insurance, recording real estate titles, stock exchanges, etc. are already proven business models. The distributed ledger is less about upending how these existing systems work, and more about porting the logic that runs them to provably secure distributed infrastructure we can all collectively trust to fairly process our lives. From a technical perspective, this view paints the token market as a globally liquid venture capital ecosystem where participants are betting on the ability of teams to execute advanced mathematics (from cryptography to game theory) in the most resource efficient and provably secure ways possible. From a socio-cultural perspective, this view runs counter to the techno-optimism that has run rampant throughout the technology space for decades. Little did we know “move fast and break things” would have unintended consequences like breaking democracy by encouraging platforms to polarize users for increased engagement dollars. If the previous era of the internet was about the unfettered exploration of the new, this generation is about putting the pieces back together to solve the much thornier issues of trust, governance, checks, and balances. Xoana excitedly pours over the results of her test again and again. She thought for sure she had botched the last section and was destined for MOOC purgatory. Sure anyone in the world can take the pre-recorded course for free, but she didn't spend the last nine months preparing to settle for an automated professor. Out of 47,328 global test takers, she secured 1 of only 500 "live" spots in Harvard's prestigious political science fast track program. For passing the exam at such a high level, the school deposits 5000 HBX tokens in a wallet application on her phone. Her wallet contains over 20 other asset tokens including coffee shop loyalty points, Brazilian Reals, US dollars, and one ounce of tokenized silver her grandfather gave her as a high school graduation present. While the program can be completed entirely online, students are encouraged to attend a week long orientation program in Cambridge to meet face to face. Xoana looks at the combined value of her tokens and dismays that she will not be able to afford the trip. Fortunately, a wealthy alumnus group has funded a smart contract for just such an occasion. She submits an application for a travel scholarship which consists of nothing more than a blank text box. All relevant information including her age, performance in school, performance on the entrance exam, geolocation history, social web, frequency of her phone usage including charging patterns and length of time spent in all of the other apps on her phone... is automatically transferred to the smart contract Artificial Intelligence for review. The AI is not confident enough to make a determination, so it schedules a quick video chat with one of the alumni. After the call, not only does Xoana have enough to fly to Cambridge, but has also made a new mentorship connection. At the airport, Xoana places her index finger into a fingerprint scanner. Her encrypted ID seamlessly talks to databases at the Caracas airport which verifies she can leave the country, the Boston airport which verifies she has a travel visa, and the airline which verifies she has a valid ticket. Because Xoana converted her alumni gift into airline loyalty points to book the flight, her fingerprint also gives her access to the airline lounge. The timestamp on her loyalty wallet is less than 12 months old, so she doesn’t get access to the platinum area which is reserved for longtime token holders, but is still happy to experience the perks of status travel. Once past security, Xoana converts her Venezuelan Bolivars back into a more stable mix of US dollars and Bitcoin she can use while she is in the US. All currencies that are not Bolivars are officially banned by the government, but this is only a formality at checkpoints as untraceable privacy assets can be purchased on a decentralized network of global exchanges just as easily as Bolivars with minimal conversion fees. The next day while at orientation, Xoana notices the value of her HBX tokens has increased. HBX tokens are not just credits for classes, but represent real ownership in the endowment that runs the political science program. The catalyst for the move upward in HBX price was a recent global ranking report which placed the program back at number 1 in the world. Similar to a bumper earnings report, the good news increased the price students/faculty/investors/etc. were willing to pay for ownership of the asset. Capitalizing on the price spike, Xoana happily sells 100 of the HBX tokens she was awarded for doing so well on the entrance exam for sightseeing tour tokens to explore Boston before returning home. Unbeknownst to Xoana, Bill was the counter party who purchased her HBX tokens off the exchange to guarantee a spot for his son in the live program. By provably burning 1,000,000 HBX tokens (eg sending them to an address with no private key) Bill effectively performed an HBX share buyback which indirectly increased the value of the remaining HBX. Bill’s large donation triggers an endowment board vote that results in 177 for, 134 against, and 15069 absent, just enough to grant his son admission to 1 of 10 spots held for legacy students. An OLED screen on a small bench outside of the political science lecture hall is updated showing Bill’s name as a silver level contributor to the department. The road ahead for Xoana will not be an easy one. Every class has a certain number of HBX tokens up for grabs, and competition is fierce. As a scholarship recipient she needs to be ever diligent as the top global performers in the free program can take her spot if she ever drops into the bottom decile of her class. Is this vision a world we want to live in? Strengthened the grip of totalitarian state control that can prevent people from moving between borders, or even attaining basic goods and services without the blessing of an all powerful system. Reinforced a capitalist system run amok which continues to entrench a wealthy ruling class, based increasingly on the cognitive ability to jump through pre-defined mental hoops. Lowered geographic barriers that have prevented billions of people in developing countries from having access to stable stores of value, investments, education, and other privileges previously available only to the wealthiest and most well connected. Created entirely new incentivization structures that reward new kinds of behaviors. Rather than stuck in the limited existing ways of structuring incentives, this new system is free to explore the limits of game theory to reward participants in ways that minimize adverse selection and moral hazard. The entire harvest of bananas lost from one Salmonella outbreak because location data was not shared between members of the supply chain. The laborer that loses 1% of her wages every time she tries to send money home. The marauding silicon valley big data giant making 10 dollars per user per quarter on advertising, while providers of the data unwittingly feed a closed source artificial intelligence with zero profit sharing. If any of the use cases below interest you buckle up, we're in for a wild ride. We feel three distinct groups will benefit the most from reading this book. Family offices, sovereign wealth funds, and other institutional investors looking to diversify into an emerging non-correlated asset class that will run the monetized infrastructure of the new internet. Entrepreneurs and corporate intrapreneurs looking for the best platforms to launch their new ideas on, and what the potential pit falls and opportunities are when creating distributed applications. Retail investors and lay professionals looking for a more nuanced and holistic view of the space to hedge their personal portfolios by participating in the ecosystem as early adopter users. In a distributed system, two people can transact value with each other without the need for a middleman to facilitate the transaction. For the first time in history, “trust” is now distributed instead of centralized. Applying existing computer science and cryptography principles in new ways will allow us to fundamentally rewrite how our institutions work, increasing transparency and accountability throughout the value chain. We will begin by giving every reader a crash course in how distributed ledgers work from a high level computer science perspective. From zero experience in the space, to complete technical mastery of all things that science computers, we feel all readers can find their own important takeaways from these first few introductory chapters. We will attempt to demystify the distributed ledger space by explaining the rapid evolution of the technology from its humble origins in the Bitcoin blockchain, to more recent implementations that will enable a global network of interconnected distributed ledgers to form the backbone of an entire new internet of value. 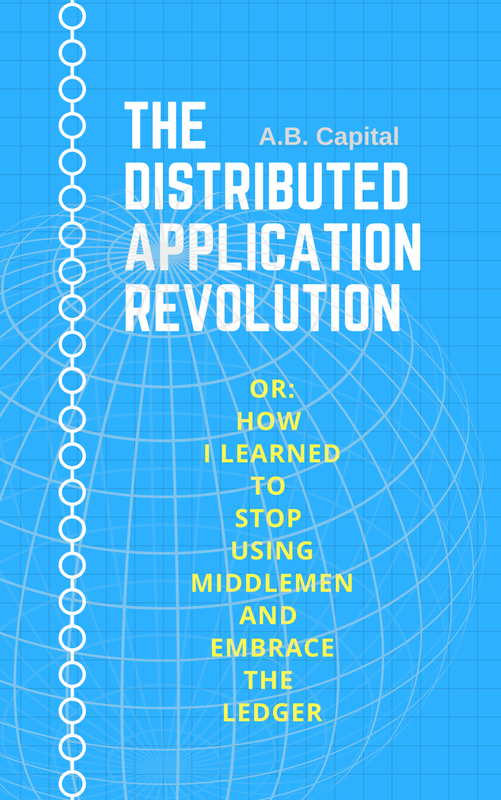 1.1. dApp Revolution: An explanation of what "distributed" applications (dApps) are, and how they are fundamentally different from existing centralized cloud applications. 1.2. Brute Force Consensus: The Bitcoin chapter where we explain how Bitcoin works, the core elements that make it successful, and potential pitfalls that can derail the first wildly successful distributed ledger project. 1.3. Other ways to Make the Sausage: The "Altcoin" (not bitcoin) chapter where we explain how competing systems (called protocols) attempt to do what Bitcoin does at a larger scale and more efficiently. 1.4. Good Architecture: An overview of how these new protocols are designed as many distinct overlapping layers. These layers interact with each other efficiently by only performing actions in the part of the subsystem most relevant to the task at hand. 1.5. In Shard we Trust: Dissecting how monolithic ledgers can be split into scalable chunks of data using sharding, and an explanation of how consensus between shards is possible using Merkle roots while cognizant of hard computer science problems like Sybil attacks. 1.6 High Assurance: We will explore the continuum on which we trust the developers writing the code by learning how high assurance functional programming and formal verification paradigms work. 1.7 Oracles, Identity, and the Real World: How technologies like oracles, multi signature addresses, and identity management dApps allow us to verify that information stored in distributed ledgers honestly represents the real world. The oracle and identity technology stack allows the potential to bring democracy into all facets of business and political processes as just one of many potential use cases. 1.8 Quasi Privacy to Data Security: We will end part I by answering the fundamental paradox of how immutable undeleteable records and privacy can co-exist. In an ideal world, the best system would immediately be discovered and adopted. However, the real world is a complex adaptive system with many agents acting in their own self interest both rationally and irrationally. Thus, Part II is a deep meditation on the motivations beyond the technical that drive success and failure in the distributed ledger space. DLT is about recreating the earliest days of the internet where open competition was encouraged because all participants had the same access to build and monetize their creations using the same infrastructure. 2:1 Fitness Landscape: Competition is fierce. Trillions of dollar of capital are on the line for whoever can capture the most market share from entrenched centralized players in every major industry from banking, to media, to supply chains. Framing the conversation in terms of evolutionary biology will help guide the rest of part II by giving a backdrop to why the life cycle of innovation, adaptation, and ultimately death is a natural part of all business processes. 2:2 Public Ledgers Matter: Our first stop on the fitness landscape attempts to shape the conversation around how private/permissioned/closed source ledgers will compete with public/permissionless/open ledgers. We also formalize the concept of the “fingerprint internet” where a global public base ledger is used to store hashes of higher level public and private chains. 2:3 Howey Test vs “Sufficiently” Decentralized: We will dissect the notion of ledger networks as nothing more than a shared set of rules about values that govern how the system works. Through this lens we will investigate how regulatory models apply to the DLT space. Before dipping your toes into new waters, know the rules. 2:4 Distributed Business Model Framework: We will attempt to create a generalized framework that describes the process of more equitable platform building. Using dUber as our example, we will explore why a 30% fee model exists, and how to disrupt value creation to benefit all participants in the ecosystem. Up to this point in the book we have mostly been complaining, but will now switch gears to offering solutions. 2.6 Weakest to Strongest Incumbents: Knowing everything we now know, let’s put ourselves in the shoes of centralized incumbents to see where the lowest hanging fruit lies by analyzing specific business verticals. 2:7 Epilogue (In an A.I. World Your Data Has Value): We will catch up with Xoana 10 years post graduation to see how she navigates the distributed world using services like dUber and dBay in her daily life, as well as participating in the healthcare, news, and political data markets among others. We hope by the end of this book a new generation of investors and entrepreneurs will be excited about leveraging distributed ledger technology to create a world that pays more than lip service to “being more open and connected”. This means leaving idealism and egoism at the door to take a deeply introspective look at the ramifications DLTs pose to the daily lives of billions of people. A helpful way to keep this egoism is check is to place the Macbethian melodrama that was Theranos in the front of our minds as we take this journey together. At Theranos, the rewards for creating a blood testing machine that could perform hundreds of tests with a single pin prick of blood were immense. Unfortunately, the realities of how diluted a sample of blood could be before causing issues with the sensors in the machine (e.g. the laws of physics) got in the way. As much as we want to downplay the gravity technology plays in our lives, at some point distributed ledgers will be life and death where we implicitly trust that the machine is not broken. Who gets a kidney transplant and who doesn't is based on a record in a database. Who is considered a political dissenter is based on a record in a database. Who gets to participate or not participate in a monetized middle class, again also just credits and debits in someone’s global ledger. Unlike Theranos' technology, distributed ledger technology works today in a crude but effective form, and will continue to advance over time by incrementally solving the next set of computer science challenges. Many projects will fail for reasons honest and duplicitous, but the collective body of work will live on as successive generations continue to innovate.